History has repeated itself! Clackamas County landowners have again been chosen to receive the Oregon Association of Conservation Districts’ Cooperators of the Year for small acreage farms. This year’s recipients are Pete and Carrol Haushalter from the Molalla area. It all started on a sunny Saturday morning over coffee and doughnuts. The neighbors along Milk Creek were invited to see a riparian restoration project that one neighbor had completed, just to see if anyone else was interested in a similar project. “The more restoration projects along a stream, the healthier the stream becomes,” states Jenne Reische, Riparian Specialist for Clackamas County Soil and Water Conservation District. 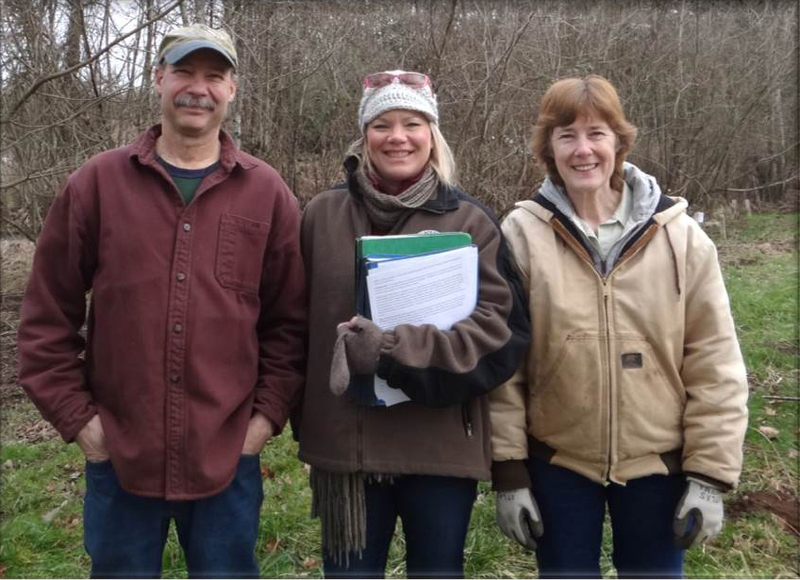 Jenne was thrilled when Carol and Pete Haushalter invited her to their property to see if they too could restore their section of Milk Creek. At the time there was no streamside shade and some serious erosion was occurring on the bank. The Haushalters began their restoration with weed control and site preparation for planting trees and shrubs for future shade on two acres along Milk Creek. While this part of the project was in progress, Jenne and the Haushalters began looking for a way to reduce the erosion while also improving fish habitat. Milk Creek is used by Coho salmon, spring Chinook, and winter steelhead, as well as resident cutthroat trout. One of the experts contacted about the project was Meghan Walter, State Hydraulic Engineer for USDA Natural Resources Conservation Service. Meghan offered her engineering services to help come up with a design to address the erosion and provide the much needed salmon habitat. The proposed solution, a vegetated log matrix, was designed to slow down the velocity of the water over a continuous stretch of stream; protect the revegetation of the bank; collect woody debris; collect and deposit gravels; and provide cover, shade, and refugia for fish during various life stages. 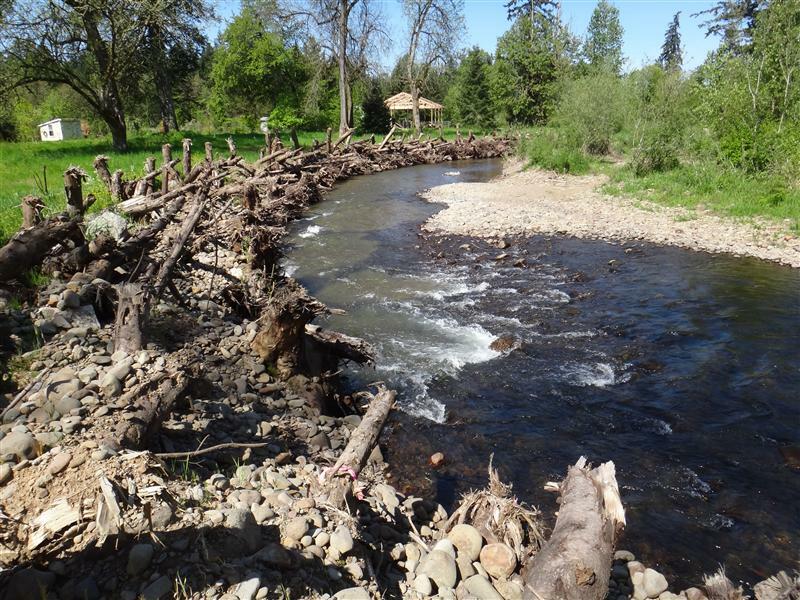 During 2012, the log jam was constructed and has been very successful in protecting the original planting project and improving fish habitat. The plants have had over a 90% survival rate due to continued maintenance and attention by the Haushalters. The invasive weeds that once dominated the buffer are almost eradicated. The Haushalters have continued to improve habitat on their property by constructing livestock exclusion fencing and a bat box. The camouflage painting on the bat box demonstrates the attention to detail and care that the Haushalters put into all projects concerning their property. Congratulations to Pete and Carrol Haushalter, Oregon Association of Conservation Districts’ Cooperators of the Year for small acreage farms! Obstruction Removed — Fish Jumping for Joy!